In April 1861, the Poor’s Frye Village neighborhood displayed some of Andover’s most spirited and vocal support for the town’s soldiers. The Andover Advertiser reported, “The old spirit is fairly in a blaze in this little place, and every one, young and old, native and foreign born, are ready to stand up for the glorious Stars and Stripes.” Both William Poor and his older son Joseph W., a blacksmith who had followed directly in his father’s footsteps, were chosen as delegates to represent their neighborhood at the meetings for Andover as a whole. But despite this enthusiasm, the Poors apparently decided that sending one son, Charles H. Poor, to the army was sufficient. 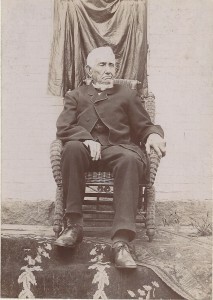 Joseph W. Poor spent the war years in Andover assisting his father with the wagon company and serving as a town Constable. In July 1863, thirty-three-year old Joseph Poor was drafted from the enrolled militia and paid a $300 commutation to avoid service.